As fantastic as the iPhone/iPod Touch is, sometimes it is just not practical for people with bigger hands. I know when I come across an app that doesn’t allow landscape orientation, I wail and gnash my teeth (only partially untrue) while laboriously pecking at the screen. iAcces Limited has taken those frustrations and funneled it into their app-making efforts, giving us the iTypeFastR Clipboard. 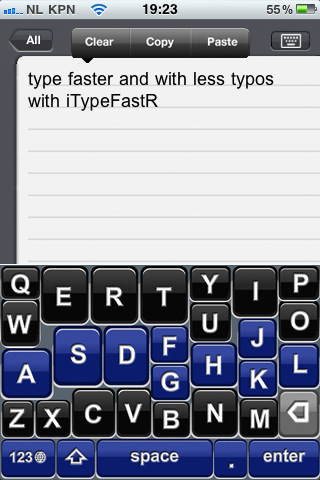 iTypeFastR Clipboard hosts a unique keyboard, an interesting derivative of the standard QWERTY keyboard. Using statistics such as “‘E’ is 12% of all keystrokes, but the ‘Q’ less than 0.1%,” they’ve designed it so that oft-used keys feature more prominently on the keyboard, in hopes of both speeding up your typing and lessening the chance of typos. You have the option of typing your message in the app, and then copying to paste it elsewhere; another is to send it to email or text directly after typing. For the former, you will be able to see the Copy and Paste buttons at the top once you tap the Compose button at the top right. The latter requires you to go back to the main page in order to direct the message; you can also delete individual notes from here. And of course, once you are composing a note, you are able to change between landscape and portrait orientations. As fantastic as this idea sounds, I found that the “new and improved” keyboard still took some getting used to before not seeing any typos. I am also one of those freaks who composes messages that have accurate punctuation, capitalization, and grammar, so although a site like DamnYouAutocorrect.com exists (and is actually one of my favorite stops), I’d rather have Autocorrect and Autocomplete than do without. iTypeFastR Clipboard does not support these functions, so I’d love an option to turn them on in this app. It’s not flashily designed, but how much pizazz do you really need for a typing app? (I will say that making the rows alternating colors is great, though.) iTypeFastR Clipboard might not work for you if you’re already married to the original keyboard format, but for $0.99 you have a chance at potentially making it easier on yourself. AppSafari review of iTypeFastR Clipboard was written by Julie Guan on January 27th, 2011 and categorized under App Store, Email, Notes, Utilities. Page viewed 4713 times, 1 so far today. Need help on using these apps? Please read the Help Page.